Summary from Goodreads: For Kitty Doe, it seems like an easy choice. She can either spend her life as a III in misery, looked down upon by the higher ranks and forced to leave the people she loves, or she can become a VII and join the most powerful family in the country. 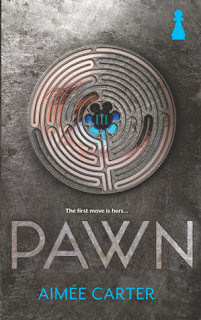 Pawn is a fantastic new dystopian novel full of action and intrigue! While the book had elements of some other popular dystopians (class systems, testing to find out where you belong in society, a dictatorship), the story itself ended up feeling really unique to me. The story follows Kitty who finds herself branded a III - an extra who will have to work in the sewers for the rest of her life. Worse yet, she is transferred to a far-off city where she will be forever separated from Benjy, the boy she loves. In order to escape this fate, Kitty agrees to a deal when it is given to her - a deal that will make her a VII. What she doesn't realize, though, is that she will be Masked to look like Lily Hart, the Prime Minister's niece, and she will be expected to play the part without fail or she and everyone she loves will be sacrificed. When she discovers that Lily was leading a rebellion, Kitty has to decide who she can trust to keep her alive and whether or not there are causes that are worth dying for. A little bit repetitious. After awhile I started to wonder how any of the Prime Minister's family managed to survive at all, considering that they were constantly plotting to kill, kidnap or replace one another. The death threats started to almost seem expected after awhile rather than menacing! Benjy. Benjy is one of my new favorite book boyfriends. I LOVED him and I was so glad that Kitty didn't spend the book falling in love with someone else (although I did really love Knox too - but I definitely preferred Benjy, so I was glad that there wasn't really a love triangle there). Benjy was the ultimate boyfriend - smart, sweet and utterly devoted to Kitty (but willing to tell her when he thought she was being an idiot). From the very first chapter, Carter made me fall in love with Benjy! Complex villains. I loved that the villains in this book weren't necessarily all evil. Even the worst members of the ruling family seemed to usually have good intentions, at least in their own minds. There were no completely good or completely bad people in this book (well, okay, Benjy was pretty much all good). Does this mean that we agreed with the villains in the book? No way - but you could kind of see where some of them were coming from. And it did mean that sometimes it was actually hard to tell who the villains were, and that even the "good guys" sometimes did bad things, which made the book much more interesting! Kitty the pawn. This book was full of political intrigue. Kitty was constantly being pulled in different directions, wondering who she could trust and how she could possibly keep herself alive when so many people wanted to use her for their own gains. I loved that, in the end, Kitty decided to take her life into her own hands, refusing to be anyone's pawn. If you're a fan of YA dystopians, then you'll surely love Pawn! I give it 4.5/5 stars.